Quick, hide the candy jar! Feeding your child candy every day could help turn Junior into a violent criminal, according to a large study in Britain, which found that 69 percent of the participants who had committed violence by 34 had eaten sweets or chocolate nearly every day during childhood. For four decades, researchers from Cardiff University in Wales have studied nearly 17,500 participants born in 1970. They learned that 10-year-olds who munched on sweets daily were "significantly more likely" to have been convicted of violent crime by 34 than those who enjoyed candy as an occasional treat, according to the study published in the October British Journal of Psychiatry. But not all childhood chocoholics had gotten into serious trouble when they got older. Of the participants who hadn't turned out to be violent as adults, some 42 percent had also eaten sweets daily. Researchers said the study is the first to look at the longterm effects of childhood diet on adult violence. "The link between confectionary consumption and violence," researchers say, remained after controlling for variables like parenting skills and social and economic backgrounds, according to the Associated Press. 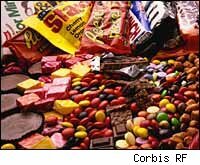 Among theories for the apparent disturbing link between high candy consumption and violence, lead researcher Simon Moore found one particularly compelling. "Giving children sweets and chocolate regularly may stop them from learning how to wait to obtain something they want," Moore said in a statement. "Not being able to defer gratification may push them towards more impulsive behavior, which is strongly associated with delinquency." Needless to say, a spokesman for one of the U.K.'s food industry groups is not amused. "This is either utter nonsense or a very bad April Fool's Day joke!" said Julian Hunt, director of communications at the Food and Drink Federation, on FoodNavigator.com. "Antisocial behavior stems from deep-rooted social and environmental factors such as poor parenting and a deprived upbringing, and is not linked to whether or not you ate sweeties as a kid." The researchers say they weren't looking to trash candy, and that they need to do more research to confirm any link. "It's not that the sweets themselves are bad," Moore told the AP. "It's more about interpreting how kids make decisions." But other studies have also suggested a link between nutrition and violence. Pilot studies in Britain have shown that violence in prison can fall by 47 percent when inmates are given vitamins and other nutritional supplements every day, according to The Journal of Life Sciences. To that end, Oxford University researchers are undertaking a three-year nutrition study involving 1,000 young offenders at three institutions in England and Scotland. The magazine also cites research by Oxford professor Bernard Gesch, who published findings in 2002 in the British Journal of Psychiatry that young offenders who received active capsules of nutrients committed on average 26 percent fewer disciplinary offenses than those taking placebos. For more serious offenders, the reduction was 37 percent. "The law tends to assume that criminal behavior is entirely a matter of free will. But how can you exercise free will without involving your brain, and how can your brain function properly without proper nutrients?" Gesch told the magazine. "The brain is a fatty organ, and our modern diet does not provide enough nutrients for it." Moore also agrees that better nutrition wouldn't hurt. "Targeting resources at improving children's diet may improve health and reduce aggression," he said. With trick-o-treating season just around the corner, the study may prompt some frightening discussions in some households.